Having established itself in the brotherhood of independent vinyl labels, this December Fruits de Mer releases its first split single with another independent label, Static Caravan. 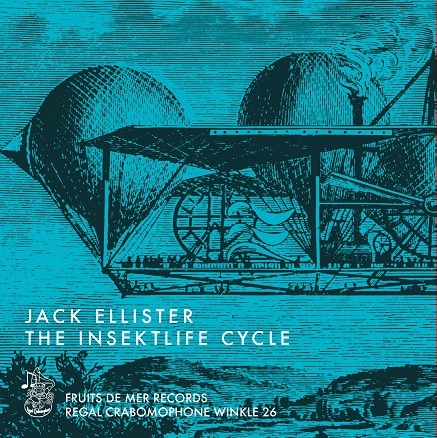 The FdM side features cuts by long-time label artist Jack Ellister and new band The Insektlife Cycle. The Static Caravan side features cuts by the Art of the Memory Palace and Cheval Sombre. Jack Ellister contributes the lo-fi neo pop psych song “Reminder” with reversed tapes, other manipulations, guitars, and synths. The Insektlife Cycle is a Philippine instrumental / progressive / psychedelic rock band. Their “Sleepcrawler” is from their upcoming debut album Neonderthal due out by the end of 2016 on China’s Weary Bird Records. This instrumental track is a trippy surf rock tune with a Hawaiian influence. Art of the Memory Palace provide an instrumental Euro synth pop track full of crystalline sounds. Cheval Sombre is a one-man band providing a dark gothic / acid folk reading of Sam Cooke’s classic “A Change Is Gonna Come.” This release is an odd collection of music and artists, but a great introduction to both labels.